Gabe Kapler marveled for two seasons as Johnny Damon, then the Red Sox’s bearded leadoff hitter, ground out long at-bats by fouling off pitch after pitch. No one saw more pitches on the 2004 Red Sox — the team that finally brought another World Series title to Boston — than Damon. And the Phillies, under Kapler’s watch, are trying to copy that approach. The Phillies are averaging the most pitches per plate appearance in baseball, seeing pitches at a rate through 11 games that is nearly a half-pitch higher than the league average. Three Phillies — Cesar Hernandez, Rhys Hoskins, and Carlos Santana — are averaging rates that rank in the top 13 of all batters. The Phillies have built a lineup showing Damon-like patience. Four teams made the playoffs last season after finishing in the top five of pitches per plate appearance. Those four teams — the Yankees, Indians, Twins, and Red Sox — finished in the top 10 of runs per game and walks. The Yankees, Indians, and Twins were in the top 10 in OPS and on-base percentage. These are the categories the Phillies want to focus on. And winning in those areas starts with their approach. It will take more than 11 games to see how much the Phillies can benefit from seeing pitches. But the early returns offer promise. Take away Saturday’s 20-run game, and the Phillies still averaged 4.8 runs in their recent homestand. The bats, after a slow first week, seemed to come alive. The team’s ability to stretch at-bats is not by accident. Matt Klentak wanted to assemble a lineup of batters who “control the strike zone.” That’s why he signed Santana for $60 million, even if it meant moving Hoskins from first base to left field. The signing guaranteed two hitters at the top of their lineup who work pitchers. They brought on hitting coach John Mallee, who spent three seasons as the hitting coach of Cubs teams that twice ranked in the top four of pitches per plate appearance. Mallee has stressed his grinding approach since the start of spring training. You don’t see pitches by being passive, he told his pupils, but by being selective. It worked for the Cubs in 2016, as they averaged the fourth-most pitches seen and finished first in walks and third in runs per game and OPS. Hoskins, who regularly bats fourth, finds an obvious advantage when the guys in front of him are stretching their at-bats. It’s not that he’s able to get a better feel for what the pitcher is throwing, but that the pitcher will be a bit fatigued by the time Hoskins gets to the plate. Members of last season’s coaching staff seemed to scoff about the number of pitches a batter saw. There did not appear to be much of an emphasis on a stat such as pitches per plate appearance. The Phillies were near the bottom in that category for two seasons, before finishing last year around the league average. Hernandez fell in line. He saw 4.2 pitches per plate appearance last season. It was slightly above average. But this year, he has seen on average 4.7 pitches through his 50 plate appearances, nearly a pitch more than he saw two seasons ago. As Hoskins said, Hernandez has bought in. Kapler did not know whether Damon’s technique was an art or a science. He never asked the outfielder whether he practiced fouling off pitches. Kapler just saw how good Damon’s hand-eye coordination was and knew that foul balls would come once Damon had two strikes. Other hitters would swing and miss, while Damon would foul off a pitch. It is an ability Kapler sees in Hernandez, Santana, and Hoskins. They, too, can battle to stay alive. He’s going to have to do it for more than two games in a row. But after watching Maikel Franco in the first two home games of the season, one has to wonder if he might be starting to get it. 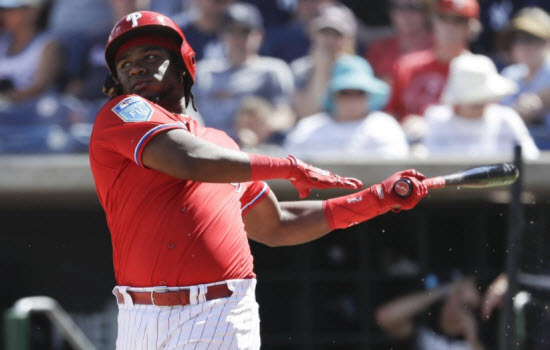 CLEARWATER, Fla. — Maikel Franco hit his first home run of spring training on Sunday. It was a beautiful shot to left field, a nice way to begin perhaps the most crucial camp of his career. But it was the placement of his left foot — the one that guides Franco’s swing — that might have been the most promising sight. CLEARWATER, Fla. — Before John Mallee ever stepped into a batting cage with a Phillies hitter, he knew him. He knew his strengths and weaknesses. He knew his tendencies. Mallee knew these things because after the Phillies hired him as their hitting coach in November, he dug deep into the numbers. 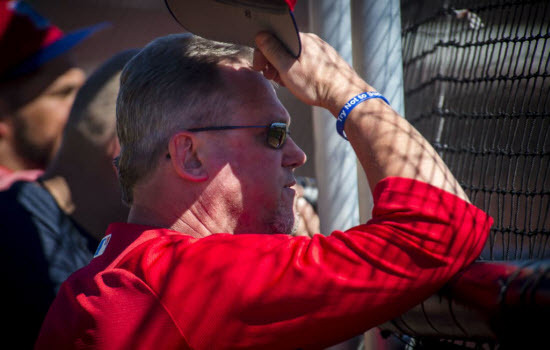 With a new Phillies coaching staff in place this spring, The Athletic is chatting with each of manager Gabe Kapler’s eight-person field staff for a Q&A. 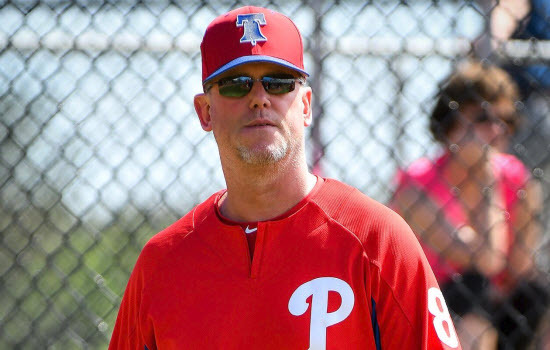 CLEARWATER, Fla. – Phillies hitting coach John Mallee is in a familiar position. His big-league coaching career has involved working with some of the best players in the game during the early stages of their careers – Giancarlo Stanton, Jose Altuve and Kris Bryant, to name a few. A Chicago native, Mallee, 48, joins the Phillies with an opportunity to mold a young, promising lineup that bolstered Philadelphia in the second half of last season. Some questions and answers have been edited for length and clarity.